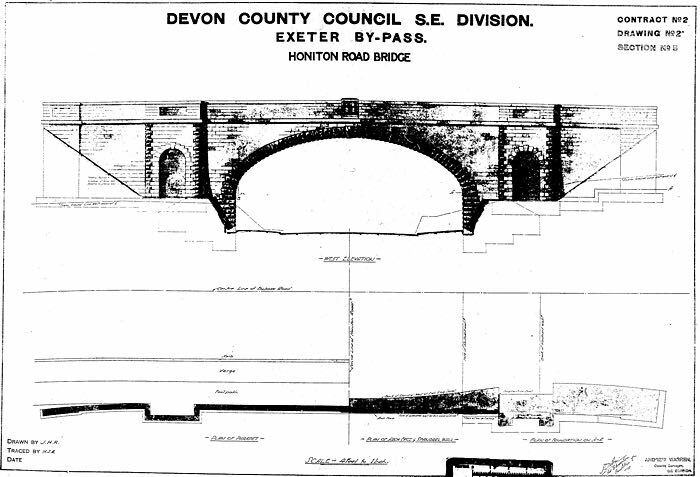 The construction of the bridge carrying the Exeter bypass over the Honiton Road, just east of Gallows Corner, was part of the second phase of the new Exeter bypass in the 1930s. The first phase, from Pinhoe Road to Hill Barton railway bridge was completed by 1933. The second phase to Countess Wear was put out to tender in September 1933, and by August 1934, was progressing well. 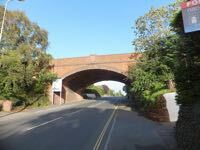 An innovation of the route was the bridge (referred to in the press as a 'flyover') over the A30, Honiton Road, a way of avoiding a roundabout or road junction. A slip road was planned to allow access from Honiton to the bypass. The bypass and bridge were designed and managed by the county surveyor, Andrew Warren. Construction proper started in October 1934. In a preliminary stage of construction, on 20 July 1934, when beams were being placed across the road in preparation for construction, an Exeter Corporation bus from Burnthouse Lane attempted to drive under the bridge, demolishing the front top deck. An amateur film maker was on the spot and filmed the extraction of the bus from under the beams (see film clip right). The Exeter and Plymouth Gazette reported the incident, thus. MISHAP TO EXETER CORPORATION 'BUS. Temporary obstruction to traffic on the Exeter-Honiton road was caused on Friday when an Exeter omnibus came into contact with the bridge which is being erected to carry the new Exeter by-pass across the main road. There was a good clearance for the bus to go under the bridge, but the road rises sharply at the other end, and the roof of the bus struck the framework of iron joist girders, each 25ft. long and weighing half a ton. One fell into the road and three balanced on top of the bus. The front part of the roof of the bus, which was on trial had no passengers, was torn off. The section between Hill Barton and Countess Wear was opened on Saturday 27 April 1935, when the contractors removed the barriers to allow traffic for the first time. 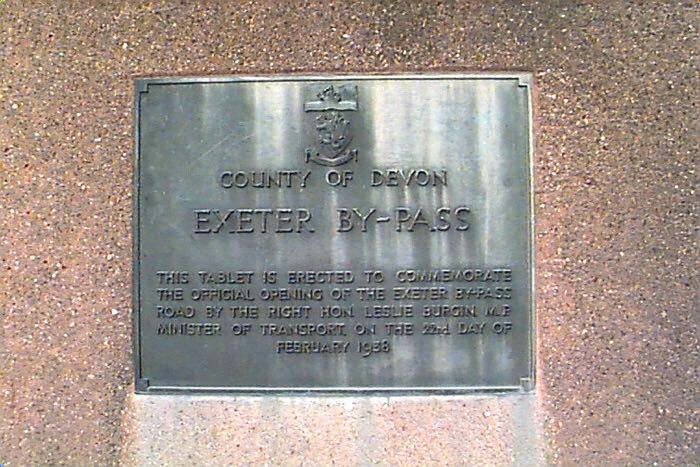 On 23 February 1938, Dr Leslie Burgin (Minister of Transport) formally opened the new bypass at the Peamore junction where the road spilt between Dawlish and Plymouth. Taking a special pair of scissors from an inscribed case, he cut the tape to open the road. 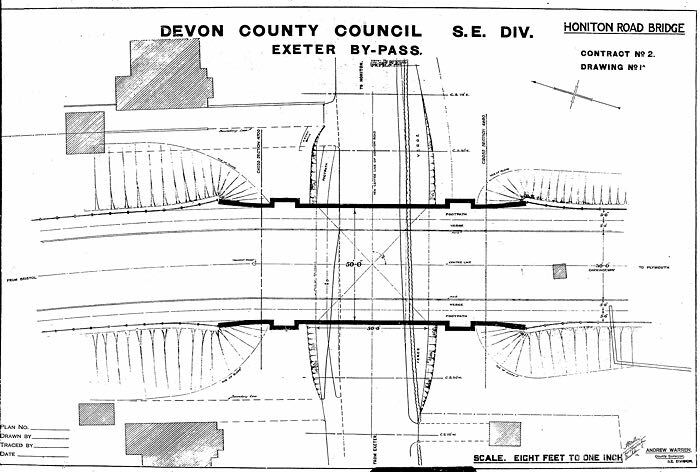 The Times wrote that the Minister had said, “The people of Exeter need have no fear of the by-pass for it was better to have willing customers who could reach the city than disgruntled tourists who were delayed on their journeys through being unable to pass through it.” The Minister was then driven along the length of the bypass to the Honiton Road bridge where he unveiled a plaque on the parapet, and the County Surveyor thanked Mr Warren for his innovative design for the bridge. Sources: Western Times and Exeter and Plymouth Gazette on the British Newspaper Archive. The bridge looking towards Exeter. © David Smith under Creative Commons Licence. The plaque unveiled in 1938. DCC plan of the west elevation. Plan of the road surface by DCC. Exeter bus crashes into bridge - 1934 from David Cornforth on Vimeo.